We seem to have a number of jumpers and cardigans going missing at the moment. Over the break, please could you check these items and also PE Kits to make sure that your child hasn’t taken someone else’s by mistake. Also, please could you make sure any new school uniform and PE kit is clearly labelled. We also have lots of spare uniform which has been donated - if you would like any of this, please just ask one of the staff. We have a growing number of parents who are keen to help in school. Mrs Williams is keen to boost her team of helpers for Guided Reading and Miss Yates is very keen to identify people who are keen to help in the Reception class. If you are interested and able to help, please let us know. Last week, we held an information session for anyone who is interested in the role of Parent Governor. We also sent home a ‘Job Description’ on the role to help people understand what is involved. Included with the information which went home was a form to complete if you were interested in the role. Thank you to those of you who have sent those through, and for those of you still interested, please send them in by the first day back in school Tuesday 1st November. Art Auction – Friday December 9th – early evening. Christmas Fayre – Friday 2nd December (3.30-6.00). 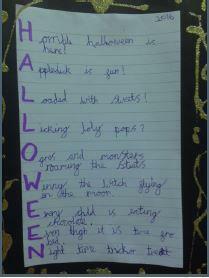 Finally, Violet in Year 2 has been busy using her creative skills with acrostic poems on the subject of Halloween!